Pray for Denmark: Room for God in Denmark? Room for God in Denmark? Is there room for God in Denmark? Members of Denmark’s Frikirkenet, or Free Church Network, believe there is. And with that in mind, leaders from Baptist, Pentecostal, independent, and house churches all across Denmark have come together in the city of Kolding for the past two days, November 8 and 9. They’re not only challenging each other to look beyond the safety of their church walls to the bigger picture, they’re seeking God’s heart and his perspective on the future of the Danish Church. “As a network, we want to be a part of making room for God in our land,” says Henrik Kaas, a spokesman for the group. That’s why the far-ranging assembly of believers invited two former members of the Folketing (national assembly), as well as a kulturminister (Minister of Culture) to offer their perspectives on faith in the public square. Engaging the culture? Kaas admits it’s not a typical topic at their annual meeting. Still, he hopes it will encourage the 100 member churches to take a more outward focus in the year to come. 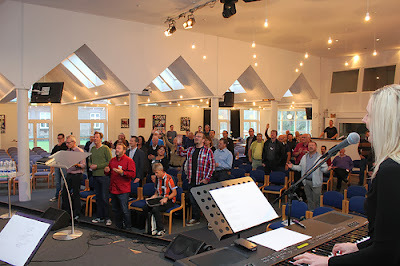 PRAY for renewal and revival among member churches of the Frikirkenet. PRAY that Frikirkenet leaders will return home with a fresh vision for engaging their culture, serving their cities, and reaching out in the name of Christ. PRAY that others will see the love of Jesus in the lives of these believers, out in the public square. Also be sure to follow us on Facebook (https://www.facebook.com/PrayForDenmark) and Twitter (@PrayForDenmark).